It was only when I search this film in Google that I came to know, there exist a compelling movie which premiered in 2006 earning $27 million on its first week, grossing a total of more than $304 million in box office and accounted an additional $89 million in revenue sales of DVD in 2007 and I only got the chance to watch it on TV under HBO channel with my two kids together with our house help for almost five years, Bebeth who seemed to appreciate it as well. Pye who's more of an action/detective aficionado preferred to be in bed early. I was teary-eyed... emotive. Where is happiness if you are left homeless? Where is comfort if you are left with an empty pocket? Even in subway restrooms, in buses or in the streets... just to shelter his son. Even up to the last cent... just to feed him. Even in the streets... just walking with him. Even it takes a dream to make his son believe. Even if he knows that dreaming is a struggle... an ordeal. Even if life for his son means sleeping soundly on his shoulder. Even in the most dire circumstances... they will survive. HAPPYness is in their hearts and in their souls... HAPPYness is having each other wherever life may lead them. The film begins in 1981 in San Francisco, California. 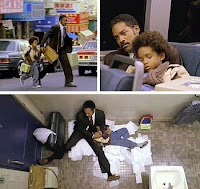 Linda (Thandie Newton) and Chris Gardner (Will Smith) live in a small apartment with their son, Christopher. Chris has invested the family's life savings in a franchise selling portable bone density scanners. These scanners provide slightly denser pictures than X-rays, but most of the doctors Chris visits find that they are too high-priced. Linda works in a dead-end job in a local hotel laundry. The tension between them mounts as unpaid rent and bills continue to accumulate. Chris often parks his car in disallowed areas so he can make scheduled appointments on time, and after parking tickets remain unpaid, their car is impounded. After missing a shift at her job, Linda finally leaves with their son Christopher (Jaden Smith), returns briefly, then departs for New York City, where a better job awaits her, leaving behind the boy at his father's request. Chris accepts an unpaid internship at brokerage firm Dean Witter Reynolds that promises employment to only one trainee at its conclusion. His lack of salary, and his lack of scanners to try to sell, leaves him riddled with debt, and he and his son eventually become homeless. After spending several nights riding buses and sleeping in subway restrooms, saddled with their meager belongings, they begin lining up at the Glide Memorial Church on a daily basis in an effort to secure accommodations for the night. Sometimes they succeed, other times they literally are left out in the cold. As he struggles to provide a semblance of a family life for his son under the most dire of circumstances, Chris becomes more determined to complete the intern program and become the sole trainee the firm will hire. In the end, Chris gets the job and later starts his own brokerage firm, called Gardner Rich, in 1987. Then in 2006 he sells a minority of it for a multi-million dollar deal. Actually, we were in tears watching every dramatic scene... It moved me in a way because I am also mother who only thinks the best life for my kids. Never have I imagined that they will suffer that kind of tribulation. Every parent wish for a bountiful life for their children. Our pursuit of happiness begins in our hearts. and as their children, it is rightful to return that unconditional love to them. You said it right. Happyness lies in your heart and YOUR heart resides with those whom YOU love. So spending time with them and sharing your day-to-day activities with those whom you love, make you haPpY.